Hong Kong has rarely been this disrupted, if not divided. No doubt Hong Kong has seen its share of wartime occupation, force majeure, shocking crimes and riots. But the Umbrella Movement, originally known as Occupy Central, is something different altogether. Sparked by seemingly irresolvable political differences and fueled by societal discontent, the Umbrella Movement caught the world’s attention with arresting images and put Hong Kong on the geopolitical world map like never before. South China Morning Post, the flagship publication of the SCMP Group and the most awarded newspaper in Hong Kong, today announced the launch of an ebook titled How The Umbrella Movement Unfolded – Part 1, a prequel that begins from 16 January 2013, the day that the civil disobedience movement was given a name (Occupy Central) and a voice (Mr. Benny Tai Yiu-ting), and leading up to the fateful evening of 28 September, the night the movement took over one of the world’s busiest financial districts, and when the first canister of tear gas was fired. 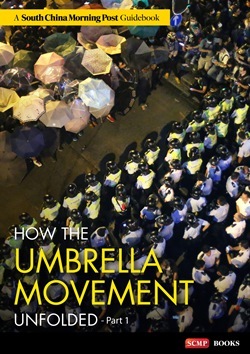 In How The Umbrella Movement Unfolded – Part 1, readers will be guided through a journey narrated by the South China Morning Post to learn about not just the build-up to the events that captured the world’s attention, but also read profiles about the principal players involved in the movement, and insights into the thoughts of citizens from different sides of the issue. This 40-page ebook, the first installment of a two-book series, is presented in a timeline format that chronicles the unfolding of an important chapter in Hong Kong’s history. In true eBook format, readers will also be able to enjoy multimedia content, as long as the reader’s device is connected to the Internet. Part 2, available for download next week, will unfold with an on-the-ground account of the daily struggles of supporters from both camps and the police, and will show in vivid colour and multimedia, how the movement grew from paralyzing a single district, to multiple districts in Hong Kong. SCMP has been ceaselessly reporting on the Umbrella Movement, and presenting opinions and commentaries for and against the movement. Coverage garnered encouraging popularity as demonstrated by increased online traffic to scmp.com. Unique users of scmp.com during the three weeks since the start of Occupy Central (28 September – 17 October) increased by more than 45% compared to the preceding three weeks, with pageviews spiking well over 110% compared to the two timeframes. Further recognition came from international media. SCMP’s Occupy Central / Umbrella Movement coverage was cited and referenced by a spate of international media including Financial Times, Washington Post, New York Times, The Guardian, Huffington Post, Time Magazine, Bloomberg, Reuters, AFP, CNBC and BBC. How The Umbrella Movement Unfolded – Part 1 can be downloaded from scmp.com/ebook. First-time registered users will have free access to the download as well as eight SCMP online stories. Download is also free of charge for existing online subscribers.